Knowing how to run a team meeting effectively can help you achieve your targets and keep the team clear about the direction you want to go. 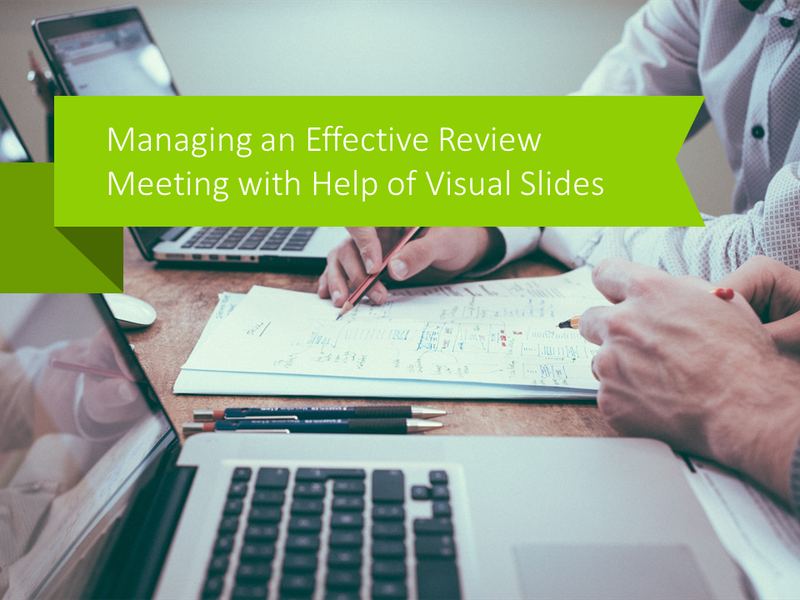 You can use the power of visual slides to make such meetings focused and effective. Here we’ve prepared a few presentation examples of various status review meetings. To keep your team aligned to work together, you need to communicate clearly what you are doing, why and where you are going. On another side you should also ensure inter-team exchange of ideas, to give space for team members to listen to one another and express their opinions, too. Running a regular team review meetings is a way to do it. Brainstorm session is a good way to find new collaboration ideas and rally the troops. However, one pitfall is that meetings eat too much time, especially if they are unorganized, the discussions last too long. To properly facilitate the team meeting you can use a set of slides that will present various meeting topics. And you can use the act of moving to the next presentation section as a clear signal for a team to stop discussing. Remark: All presented slides examples are available at Status Review Meeting PPT template deck. Why Use PowerPoint to Run Meeting Review? A team meeting is a complex process that needs to be structured. Visualization will help you to discuss all acts step by step and find the best solution. Review meeting slides are handy to plan the whole communication system in your company. Available layouts serve as a springboard for situation analysis. Showing the main ideas on a slide you will provoke your team to the active participation. The review meeting is also a perfect opportunity to share the success of your company. You can visualize achievements with creative slide layouts and icons. It will help to pay attention to the company’s strength and motivate your team to a new attainment. Below we have put together five sections that are often present in status review meetings. Following this structure, you can run your meeting smoothly avoiding time to be wasted. Having a clearly defined agenda helps to communicate what a team should expect from a meeting. This is one step towards productive meeting, especially if your meeting is a longer one. You can create an attractive agenda slide using simple shapes. We created a few variations of agenda’s visualization: bullet points colorful list, zigzag timeline and half a year timeline with the description for each month. The next section of the review presentation is showing the meeting goals. 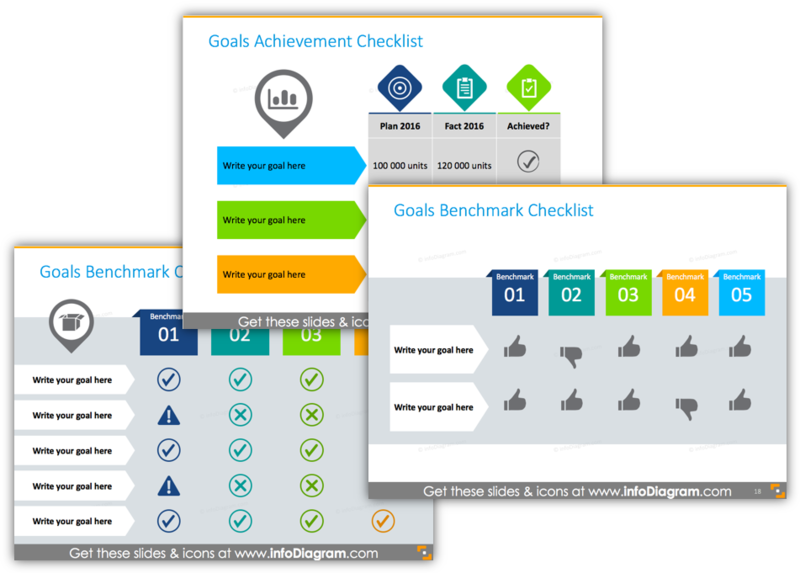 We designed two examples of meeting goals illustration on the slide: creative pencil infographics with a place for each goals description (on the left side) and pointy rectangles list you can use to replace classical bullet points list. This section presents how the company is doing at the moment. You can show your specific KPI numbers – be it product market share, production performance, sales quotas or marketing campaign so far. 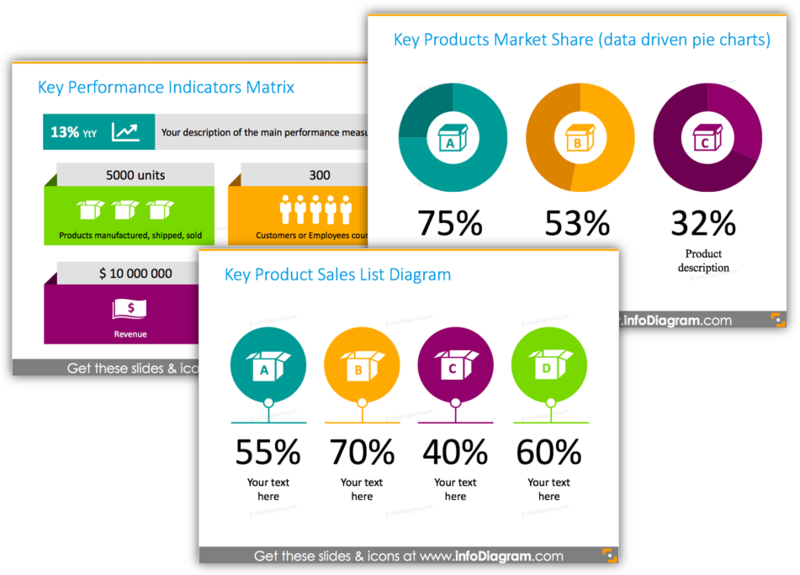 Check the slide templates above – you can easily add there your key performance indicators data, use icons representing your products. This way you will create quickly an eye-catchy PowerPoint slides, that to grab the attention of your team and make a quick review of your business situation. After presenting the status quo, it’s time to review performance against your planned goals. We designed checklists tables with status icons – a practical layout you can use for your objectives review. Demonstrate achievements that your team reached – this will motivate them to work further towards preset goals. Next part of the meeting review presentation is a planning next steps. 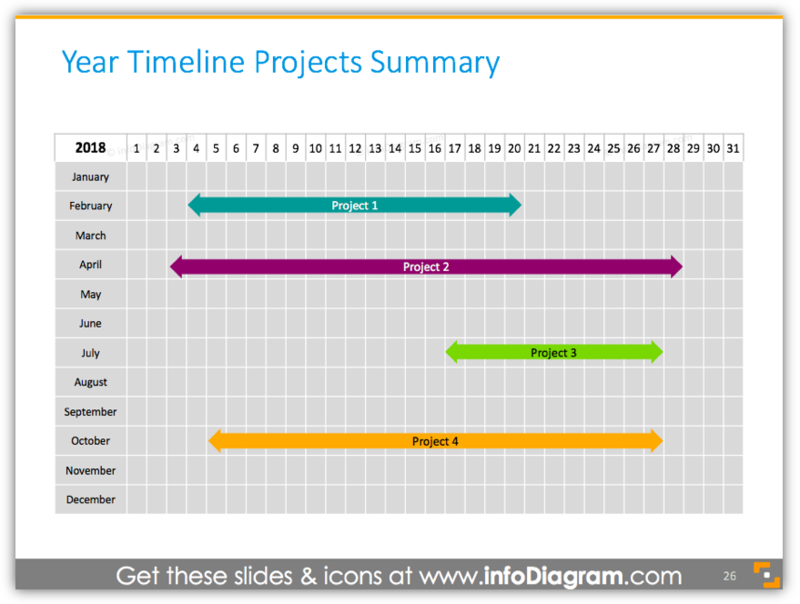 You can present a specific project timeline with help of shapes illustrating a distribution of new tasks over a calendar and hold responsible people accountable. Adding description to each point will help you to explain details – handy if you are going to send a presentation as a handout after the meeting. If you are running several projects at the same time, this slide can help you to compare different projects, how they co-exist in time, if there are depend on each other, using the same resources, to show the duration of each project. Thanks to this template you can visualize more data in the one slide, omitting details. Every good presentation should lead to some change. So don’t forget to end meeting with a clear definition of next steps, assigning tasks responsibilities. Above we proposed a few ideas on how you can put next steps in a graphical form to conclude your meeting. You can also show your operation strategy with a description of each step. Thanks to these diagrams you will keep your team focused on what you need to get done before another project review. To help you covering those six review meeting sections, we designed PowerPoint template you can reuse to manage this kind of meeting. 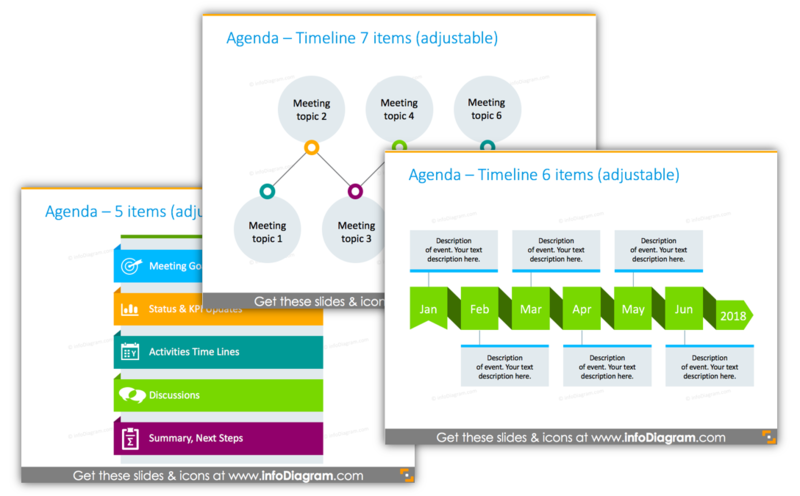 The infoDiagram Status Review Meeting template will help you to transform your usual meetings to effective ones by visualizing goals and current situation overview. You can easily prepare professional-looking slides by copying some of the predesigned diagrams and timelines into your company deck. What’s Inside Status Review Meeting PowerPoint Deck? Status review meeting collection is a template for performance review meeting type. The meeting template includes 34 presentation slide layouts: meeting agenda, objectives update, status and key performance indicators overview section, activities plan timeline, follow up section. It helps to evaluate the current market and company situation. To adjust strategy to the presented situation, set new objectives. Distribute new tasks over a time plan and hold people accountable. 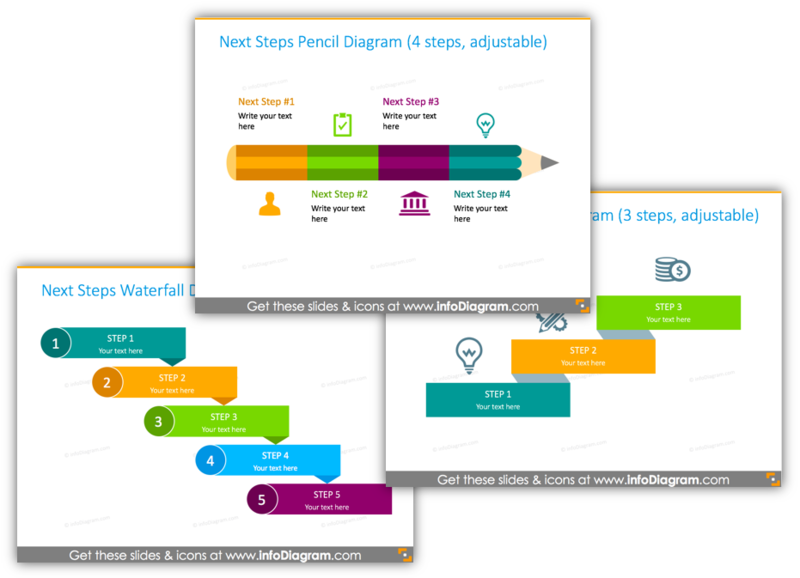 If you want more to get more extensive set of visual slides with more timelines and diagrams, check this infographic PPT graphics bundle.